Welcome to the first Homo Improvement DIY project! 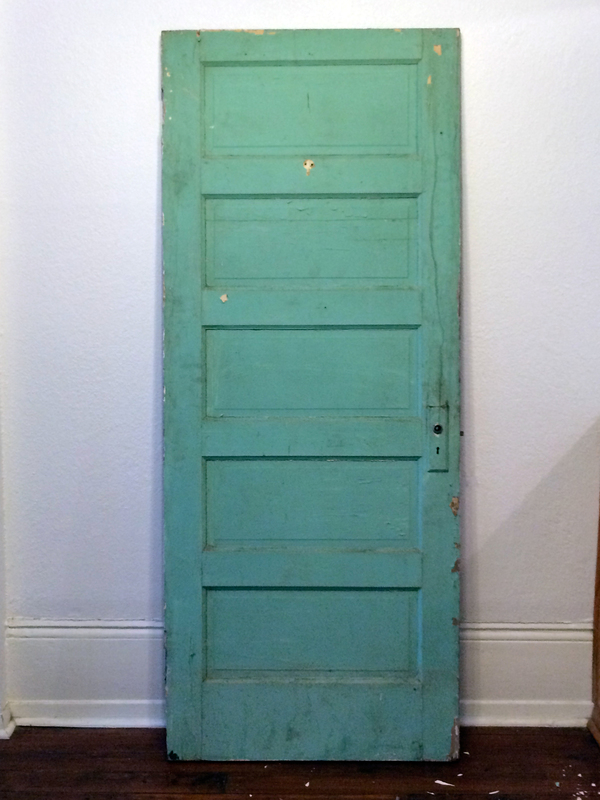 I fell in love with this teal door at our local salvage yard. It was chipping and molding away, but I couldn’t resist taking it home. The color and style don’t fit in my home, but I knew I could make it work outside. First step is to find yourself a perfect base. This project would work on a wooden fence, an old door, a pair of old shutters… anything you can find. I recommend checking out your local salvage yard or used building supply store. First, prep your base surface however you need to. Since the fading is part of this door’s charm, I didn’t take any precautions to protect it from the elements. 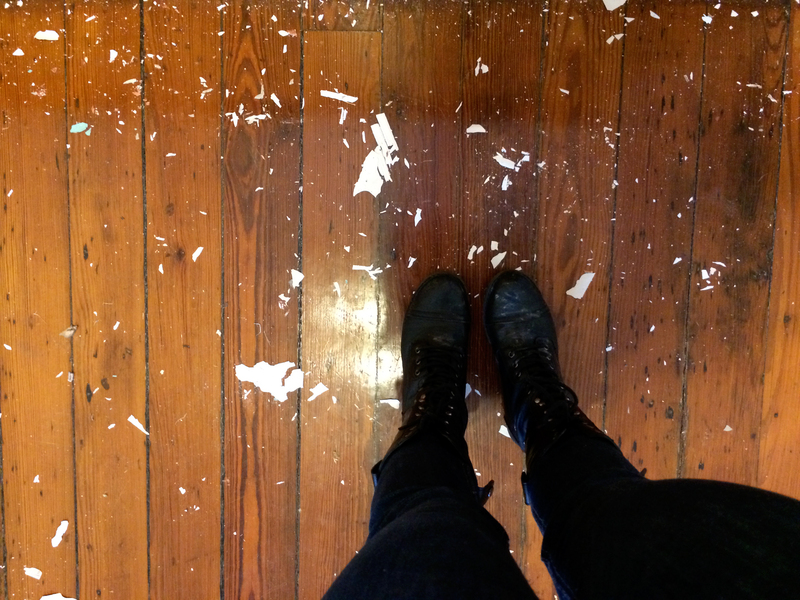 You may want to strip the paint from your door, sand it, re-paint it, or seal it. We can go over techniques for this in a separate post. 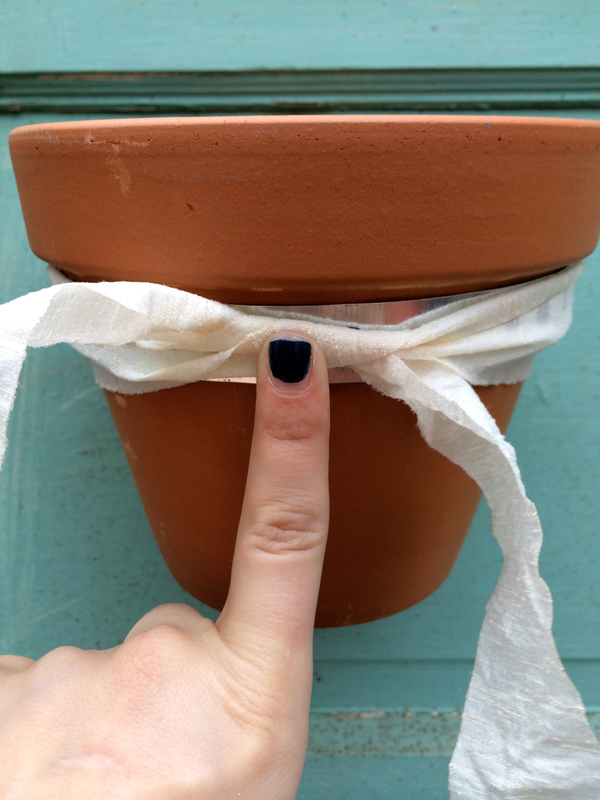 Next, take a length of hanger tape and wrap it around the top of your pot so it sits right underneath the lip. Find a place where it’s firmly wrapped around your pot, but you can still wiggle the pot in and out. Mark the place with your finger and remove the pot. Instead of measuring the length of the strip, I counted the holes in between my two connecting points – there were 35. 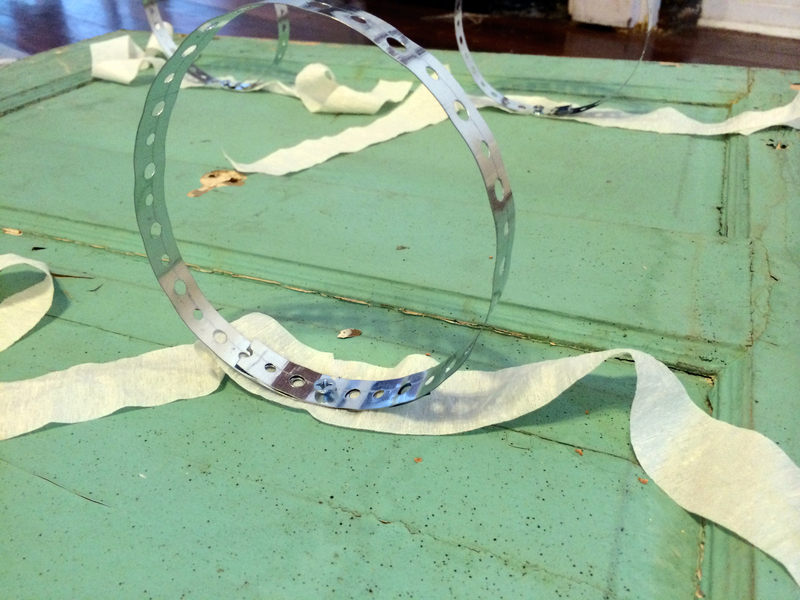 I then cut ten strips of hanger tape that were approximately 37 holes long (it’s good to have a little overlap). Then, using one of your screws as a placeholder, place the first bracket where you’d like it to be on your base. For me, this was the upper-left corner of my door. Make a mark, and measure it’s position. Mark the relative positions of where you’d like all your other brackets to be, and start drilling. Choose a drill bit that is slightly smaller than your screw. Once your holes are drilled, it’s time to start assembling and installing your brackets. Lay a strip of ribbon across your drilled hole. If you are right-handed like I am, you will want the ribbon to be about a half-inch longer on the left to account for the extra loop on your bow. If that doesn’t make sense, don’t worry, we’ll get to it. On top of your strip of ribbon, place your bracket with holes aligned. Make sure that at least one of the holes (the one closest to the head of the screw) is a small hole, so the tape doesn’t slip off the screw head. Once everything is aligned, use your drill to screw it all down to the base. Keep going until every bracket is assembled. Once the assembly is complete, tip your surface upright if you have been working horizontally. 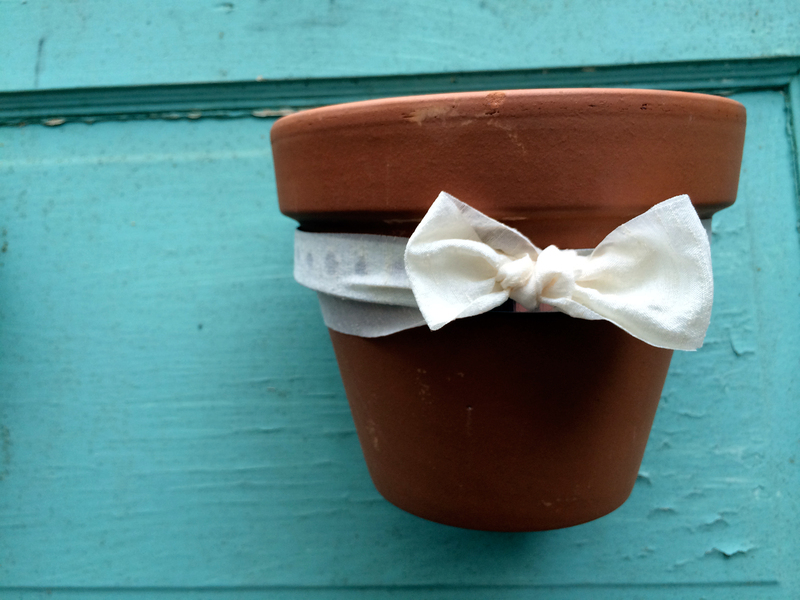 Put each pot into its bracket and tie the bow to hide the hanger tape. Of course, if you prefer an industrial look, feel free to leave the tape as is! That’s the problem that will leave you with a crooked bow! For a straight bow every time, cross left over right, then make the first loop with the left string as your normally would, and wrap the string on the right around it. Lefties, just reverse! When you are dominant on one side for both knots, it rotates the bow. Does that make sense?